It was an innocuous enough question to receive by email, especially for someone that runs a travel blog, but I had to wonder: Did the sender realize I lived in New York City which, at last check, was not normally considered a convenient starting point for a day trip to the largest waterfall in North America (Google Maps pegs the drive to Niagara Falls from New York City at 411 miles and nearly 7 hours by car)? 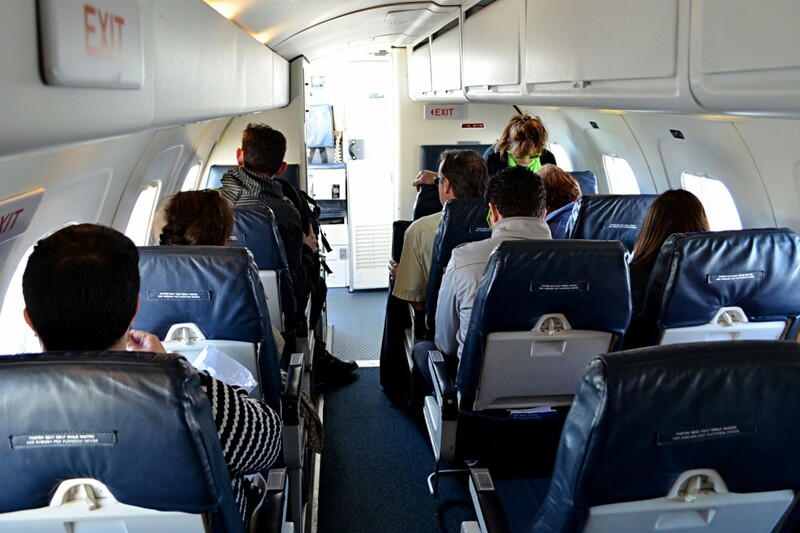 But, alas, this was no usual day trip, this was the inauguration of a new trip organized by Viator, the travel tour and experience booking site called, aptly enough, Niagara Falls Day Trip from New York by Private Plane. “Sure,” I replied, “What time do we leave?” Very, very early, it turned out. My day began in Brooklyn at 5:45 a.m., a time too often reserved for heading to bed for me, not for waking up. However, on that particular morning, I took a quick shower and hopped in a cab to our meeting point at the Sheraton Tribeca in Lower Manhattan where a chartered bus was scheduled to pick me up at 6:30 a.m.
After buying a much-needed coffee at the deli next door to the hotel, (which, I might add, was miraculously open at that hour; I’m not sure if they were still operational from the night before or were just opening for the day), I hopped in the bus and we drove through the empty Sunday morning streets of Manhattan (if you want to see the “City That Never Sleeps” asleep, take a drive down Canal Street at 6:45 a.m. on a Sunday morning). 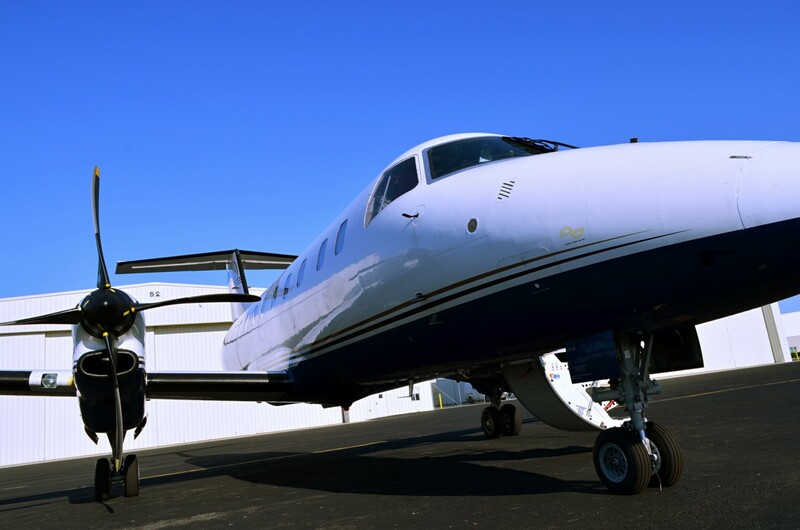 We then drove an hour west to Republic Airport, the small, regional airport located in East Farmingdale, Long Island. Of course, when traveling in style, i.e, chartered plane, there’s a little timesaver involved called “skipping TSA.” When we arrived, our bus drove through the airport parking lot and straight onto the tarmac, directly next to a waiting plane, an Embraear 120, a Brazilian manufactured, 30-seat twin-turboprop commuter airline whose length measures a manageable 66 feet, and which maxes out at a cruising speed of 378 m.p.h. Just minutes later we were strapped in and making our way down the runway for takeoff, a surreal experience for anyone used to lining up and waiting on the seemingly always crowded runways at nearby LaGuardia and JFK Airports. Once airborne, the flight itself was a svelte 1 hour 10 minute-long jaunt northwest over the length of New York. On board was a chipper flight attendant who served us drinks to accompany the bagged breakfasts consisting of a croissant sandwich, fruit cup and yogurt that were waiting for us on our seats. As everyone around me quickly passed out and napped the entirety of the flight, I worked my way through an issue of Time Out and then only through the introduction to the newest issue of Vanity Fair before the pilot announced that we were beginning our descent, a record accomplishment of futility in reading for any trip — a sure sign of briskness. While on board, I was informed by Viator they had put this trip together due to growing consumer demand from travelers looking for unique one-of-a-kind day trip experiences from New York. Utilizing private coach buses and local regional airports, the trip focuses on convenience and efficiency to maximize time spent at the falls. It also focuses on people who have lots of cash-money on hand. The trip isn’t cheap — $579 — but isn’t all that expensive given the amount travelers experience for that price. 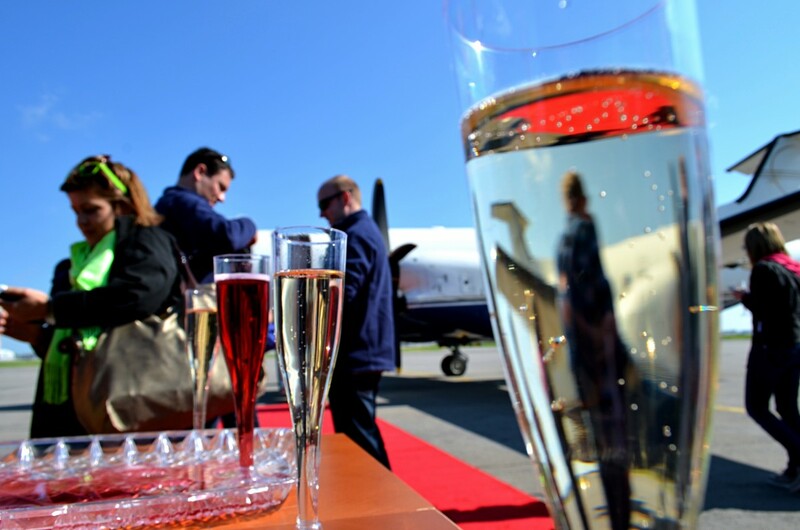 By 9:52 a.m. (according to my Twitter feed), we had landed and made our way down the red carpet that had been laid out for us, leading to a table topped with champagne flutes, always a welcoming sight upon arriving at any airport. I’ve been told the red carpet and booze will not be a normal occurrence for day trippers, but I’m sure arrangements could be made in advance for special occasions or potential visiting dignitaries. Of course, FAA regulations would likely bar such activities at Buffalo Niagara International Airport, which was located 18 miles to the southwest from where we had landed. 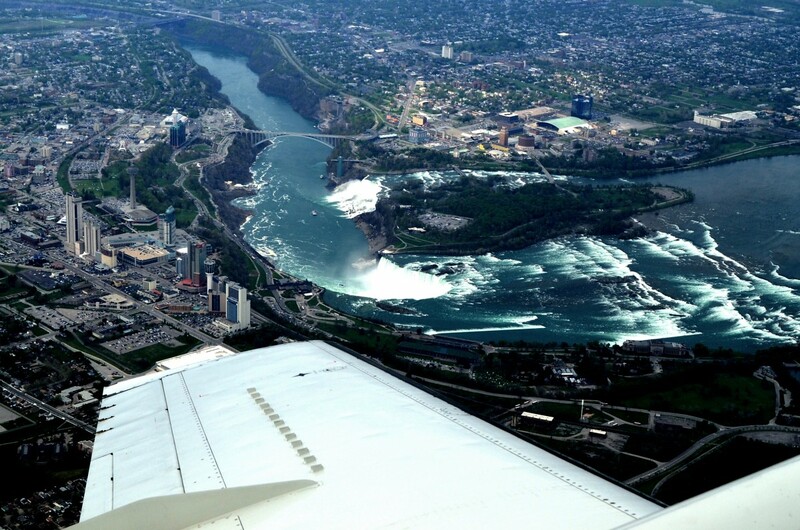 But, lucky for us, we had landed at Niagara Falls International Airport, located 18 miles closer to the falls, and more importantly, on the opposite side of Buffalo, meaning we were just a short 12-minute ride to our destination. Yes, it doesn’t get much easier than that. For the same price, travelers can choose to visit either the American or Canadian side of the falls. For those unaware of the layout of the area, Niagara Falls themselves are actually a series of three waterfalls — Horseshoe Falls, the American Falls and the Bridal Veil Falls — which are collectively located about halfway up the isthmus where the Niagara River flows northward, connecting Lake Erie in the south to Lake Ontario in the north. Where the falls are located, the river has abruptly turned north after having made an abrupt right angle turn to the west. 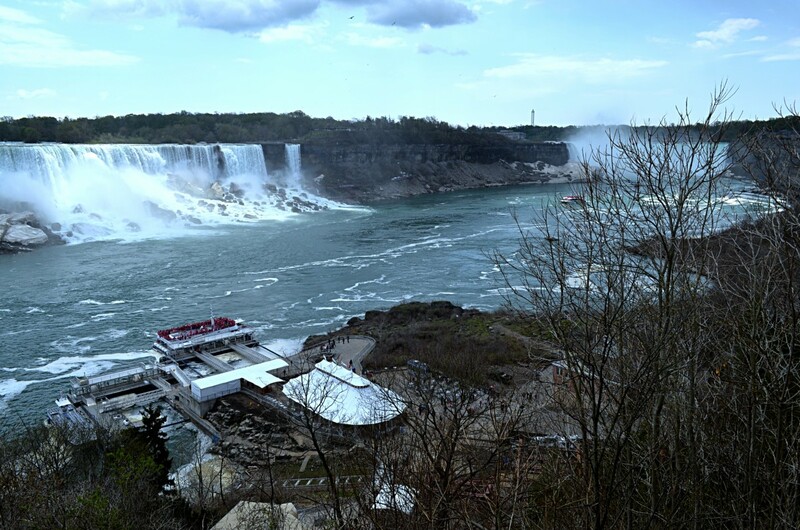 The larger falls closer to Canada that create the “elbow” in this turn is Horseshoe Falls and is in Canada — the American Falls and Bridal Veil Falls are just to the north straddling the American side of the river, and are thus considered U.S. territory. What this means for visitors is that if you want see the falls from the Canadian side, bring your passport: the bus drops off those who want to stay in America at the entranceway to Niagara Falls State Park (American’s oldest state park in fact), and those that want to make their way to the more built-up, casino-and-high-rise-hotel-laden side of the attraction, can stay on the bus and make their way over Rainbow Bridge (so named for the nearby rainbows that are prone to crop up due the mist kicked up by the falls) to Canada. After a quick stop-off at customs on the Canadian side, we were dropped off at Table Rock Welcome Center, located at the edge of Horseshoe Falls. We were then led into the welcome center where we were handed lanyards with “Adventure Passes” attached (they sell for $50), which allow you entrance to, most importantly, the river cruise run by Hornblower Niagara Cruises, the behind-the-falls hike known as Journey Behind the Falls, and White Water Walk, a boardwalk that runs along the base of the falls. By this point it was 11:00 a.m., and our group was told that our bus was scheduled to head back at 2 p.m., leaving us a few hours to explore. With waterproof GoPro, DSLR and videographer in tow (you know, normal travel entourage), our group of three travel bloggers headed straight to the river cruise, located 10 minutes away down a scenic path that overlooks the falls and the river they feed hundreds of feet below. As my article researcher (otherwise referred to as “Mother”) later informed me, 2014 is the first year there are two difference companies offering river cruises at the falls. 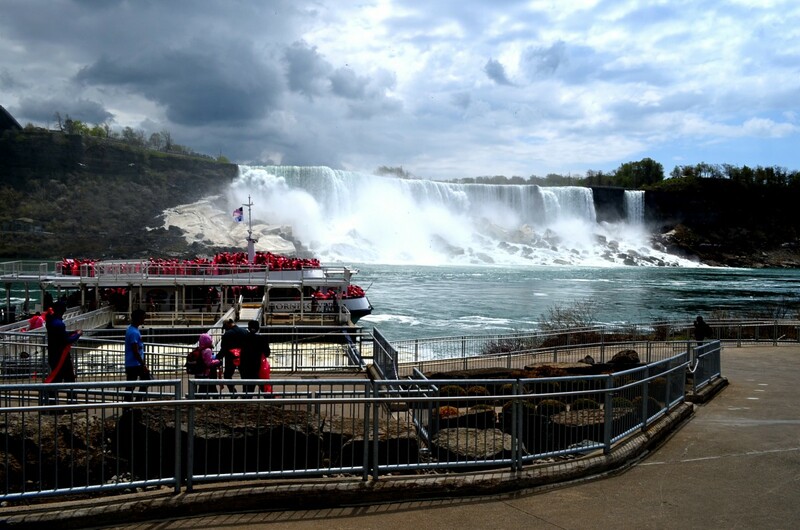 Since the mid-1800’s, the famed Maid of the Mist tour boats have led poncho-clad visitors from both the American and Canadian side of the falls to the falls. After losing their contract in 2013, Hornblower Niagara Cruises now has exclusive rights to launch their two 700-person catamarans from the Canadian side. After making our way down a long walkway to the boats, we were handed red ponchos (Maid of the Mist uses blue ponchos, and I’m sure the two dueling colors are some sort of Star Wars reference), and joined a couple hundred visitors on the boat, most of whom had rushed to the upper deck of the boat. After kicking off from the shore, the boat quickly made its way past the two falls on the American side, then charged headfirst toward the center of the Horseshoe Falls, which then caused a flurry of extremely wet and harried people to rethink their vantage point and quickly make their way back to the deck below. 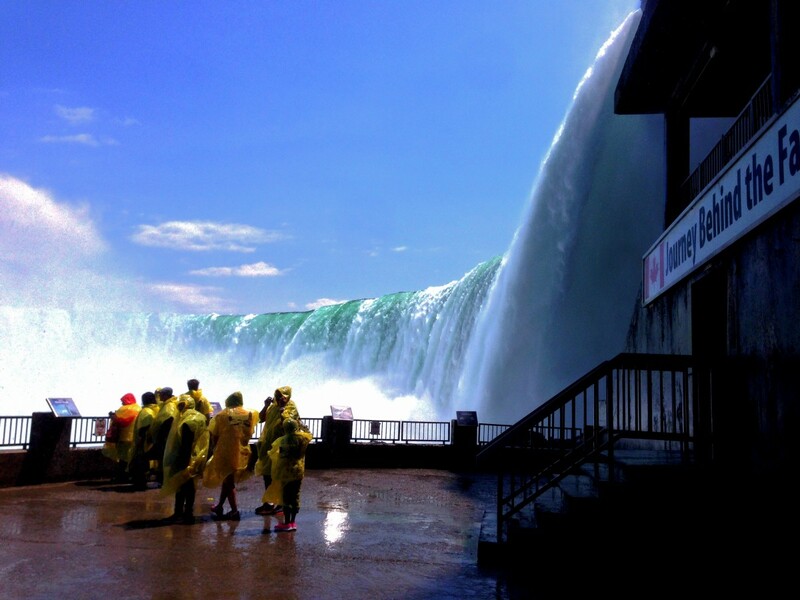 The fact is, Horseshoe Falls, measuring 188 feet high and appropriately shaped like a horseshoe, expels a lot of water. 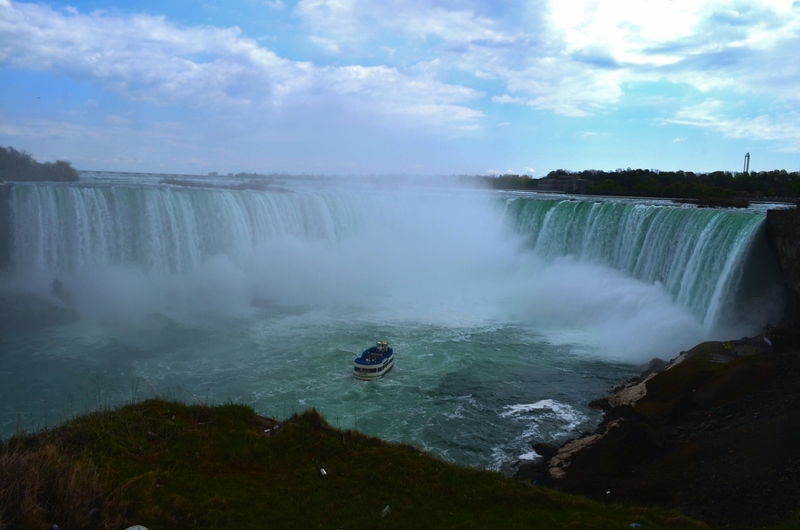 Actually, Horseshoe Falls account for 90% of all the water that flows over the falls from the the Niagara River — an estimated 6 million cubic feet of water per minute — so that produces mist. Actually, that creates a lot of mist, hence the extremely wet humans rushing to make their way to dryer conditions after what seemed like a large portion of that 6 million cubic feet of water in mist form had been directed at our boat from a gust of wind. The cruise itself was short, about 20 minutes, and before long we were docking back on the mainland and drying out our jackets on the benches along the riverside. After checking to make sure my various electronic devices were still working (miraculously, and with help of the ponchos and a messenger bag, they were), we headed up the walkway and back toward the welcome center. Given our delays taking pictures, Instagramming, sending out tweets, taking video and posting our pictures to Facebook (this is what happens when you travel with bloggers), our time was already running short. With about an hour left, I ditched my dawdling companions and took an elevator 150 feet down from the welcome center to the Journey Behind the Falls, the tunnel complex located about as close to the base of the falls as you’d want to get, which allows you access to an outside promenade at the base of the falls, as well as to a tunnel with two offshoots that allow you to walk up to a vantage point located just behind the actual falls. If you’ve ever wondered what 739,700 gallons of water falling at nearly 20 m.p.h. looks and sounds like close up, the answer is that it’s both awe-inspiring and somewhat frightening. With time running out, I met the rest of the group at the waiting bus and got going back to our return flight home. Our delay at the border getting back to the U.S. was considerably longer that heading into Canada, but anyone who’s traveled internationally would not be surprised by this in the least (you’re also at the whim of how many, and where the people are from, in the buses that happen to be in front of you in line). Once back on U.S. soil, we picked up the rest of the group at the park entrance, snaked our way past an inordinate number of Indian restaurants in town, and were back aboard our plane on the tarmac minutes later, ready to whisk us back to the city. By 7 p.m. I was at home uploading pictures to Facebook and fielding questions from friends about when I had traveled to Canada. This morning, I replied, just a quick day trip out of the city. Matt Stabile is the founder and Editor-in-Chief of TheExpeditioner.com. You can read his writings, watch his travel videos, purchase the book he co-edited or contact him via email at any time at TheExpeditioner.com.